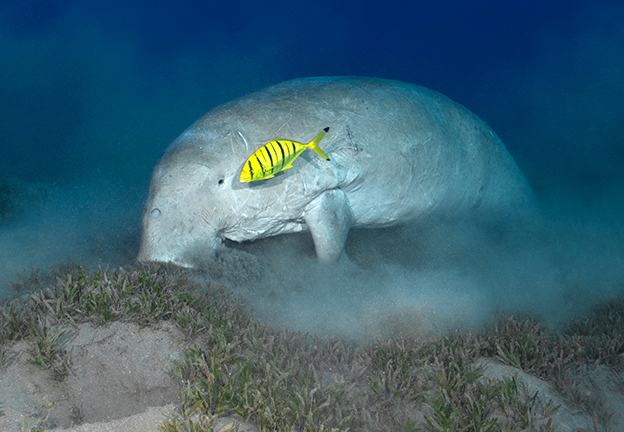 Dugong feeding on seagrass, Red Sea, Marsa Alam, Egypt. Photo by Kate Jonker. Manatees have a large, horizontal, paddle-shaped tail, whereas dugongs have tail flukes with pointed ends like a whale. The dugong has a short, broad, downward-facing, trunk-like snout with an undivided lip, whereas manatees have a divided upper lip and a shorter snout. Manatees are larger than dugongs and can weigh between 400kg and 500kg, and grow to a length of 3.6m. Dugongs rarely grow larger than 3m, and their average weight is 420kg. Upon further reading, I was disappointed to discover that manatees live in the Caribbean and the Gulf of Mexico and, as I live in South Africa, the possibility of my ever travelling there to see one was pretty slim. However, I did read that dugongs could also be found much closer to home in Mozambique and in the southern Red Sea. All was not lost, and I was determined to go and find a dugong instead! A couple of years ago, whilst on a liveaboard trip to the southern Red Sea, our dive guide took us to look for the dugongs. We spent an hour swimming very fast on scuba over a huge seagrass bed, but our search was unsuccessful, and we returned to the boat feeling exhausted and disappointed. Before returning to the Red Sea this year, I asked my friends on social media for advice and was directed to a dive centre in Marsa Alam. I promptly booked a couple of days of diving with them before joining a northern Red Sea liveaboard safari. As soon as we arrived at our hotel in Marsa Alam, my husband, Deon, and I popped into the dive centre to meet with Mirjam who had helped me with my booking. She said that if I wanted to find the dugongs, I would have to be back at the dive centre in an hour’s time. I asked if we could go out the following day instead as it usually took me an hour to put my camera together and I did not want to hold them up. Mirjam said that the following day would be too windy, and that if we wanted to see the dugongs, we would have to do it that afternoon. We rushed back to our hotel room to set up our cameras for wide-angle and managed to be back at the dive centre with all our diving gear and cameras within the hour. I must admit to having felt pretty stressed and hot and bothered, but by the time we had put on our gear in the cool, shady kitting-up area and been given a very thorough and professional briefing by Bassem who was training to be a divemaster, I was very excited and raring to go! The plan was for skipper Abdo to take a small zodiac boat out to a nearby reef where the dugong’s favourite food, seagrass, was plentiful. As we walked across the beach, our dugong spotter Biso told us that the best way to find a dugong was from the boat as, being air-breathing mammals, dugongs have to come up for air every three to six minutes, and he could then see them on the surface quite easily. He told us that if the dugong was there, we were to wait on the boat until it had taken a breath, descended and started grazing—and only then would we enter the water and descend slowly close by. He added that it was important not to frighten the dugong as it swims very fast and once spooked, it would swim away and we would never catch up. Just as skipper Abdo helped us onto our little zodiac, Biso pointed to another small boat just beyond the reef, “It’s here!” he exclaimed excitedly. When I asked him how he knew, he pointed to a group of snorkellers next to the boat, all frantically swimming in the same direction. “They’re following the dugong!” he replied. I could not believe my luck and hoped that the snorkellers would not chase it away. As we slowly came alongside the snorkellers and their boat, a large white shape surfaced next to us. It was a dugong! It came right to the surface between our two boats and I could clearly see its big snout as it broke the clear, turquoise water for a huge breath of air. I was in awe and could not believe that the creature I had only ever dreamt of seeing was actually there! It was a real goosebump moment and I think I might have shed a couple of tears whilst nobody was looking my way. The dugong swam lazily amongst the snorkellers before taking a final breath and making his way downwards to the seagrass bed below us. Mirjam told us to get ready and I quickly put on my mask and grabbed my camera. My hands were shaking with excitement! Biso had a quick look into the water and confirmed that the dugong was grazing, and we all rolled back into the water and started our way towards the sea floor about 10m below us. As I descended, I could not help but marvel at the sheer size of this creature. I had known they were big, but nothing had prepared me for how long it actually was. As I settled down next to him, I was amazed at how relaxed he was in our company and how much he was eating! It was incredible to watch how he munched through metres of seagrass, completely ignoring us. He allowed us to take a number of photos of him as he continued grazing. He was joined by some juvenile golden kingfish, which snapped up tiny creatures that were dislodged from the sea floor as he grazed. He stirred up huge plumes of fine sand as he mowed across the seagrass, and it looked as if he was floating amongst the clouds. I was enthralled by his whiskers, his tiny eyes and what looked like eyelashes. What an incredibly endearing creature! We were lucky to spend about 30 minutes with him as every time he went up for air, he came back down to us and just carried on grazing. Eventually, he must have eaten his fill, as he rolled over onto his back and gave himself a leisurely back scrub before swimming away. We spent the rest of our dive exploring the beautiful reef, which was teeming with life, juvenile fish and pristine coral. What a perfect way to end such an incredible dive! As soon as our heads broke the water, I started laughing, cheering and thanking my buddies. It had been an experience I would never forget. Back at the dive centre, Biso and Mirjam told me that the dugong we had seen was a young male and one of two that sporadically visited the reef. I had been very impressed with their considerate “don’t-chase-give-it-space-and-don’t-touch” approach, and not once did I feel we were invading this incredible creature’s personal space. This is probably why he stayed with us so long. Kate Jonker is an underwater photographer and writer based in South Africa. She teaches underwater photography, is an assistant instructor and dive boat skipper for Indigo Scuba in Gordon’s Bay, Cape Town, South Africa, and leads dive trips across the globe. For more information, please visit: katejonker.com.